Dorchester’s Noemi “Mimi” Ramos has been selected among thousands of applicants as a 2018 Roddenberry Fellow with a $50,000 grant and tailored support to build and scale the Independent Women Project, a project of Community Labor United’s child care campaign. Ramos is currently the executive director of New England United 4 Justice (NEU4J). 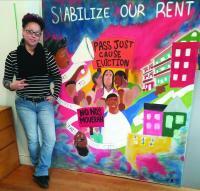 She has spent close to 15 years fighting for social, economic and racial justice in Boston. After serving as Massachusetts ACORN’s Head Organizer in Boston for over six years, Mimi and 30 other resident leaders founded NEU4J in 2010, where she and the NEU4J team provide opportunities and concrete tools for low income communities of color to engage in direct action, policy development and movement building. The Roddenberry Foundation has selected 20 innovative activists from thousands of applicants across the United States to join an inaugural fellowship program aimed at making the country more inclusive and equitable in a time of increasing unrest and intolerance. “I am excited to be selected as a 2018 Roddenberry Fellow and I am looking forward to using this grant through the IWP to shape policies and develop successful models for childcare for working parents,” Ramos said. The Independent Women’s Project (IWP), a collaborative project convened by Community Labor United, aims to create a child care model that better meets the needs of parents currently employed or seeking a job in industries with nontraditional work hours, while also changing child care policy in Massachusetts to increase access to safe, reliable, and affordable child care.